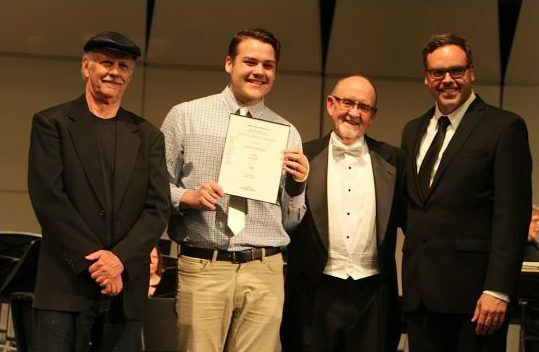 Pictured on May 9 at the Lee’s Summit Symphony Orchestra concert are, left to right: Mike Metheny, Quinn Mosier (2015 Knight Award winner and a summer scholarship recipient), LSSO music director and Metheny Foundation board member Russ Berlin, and guest LSSO conductor Kirt Mosier. Pictured on May 15 at the Lee’s Summit Historical Museum’s Metheny Exhibit are, left to right: summer scholarship winners Charles Nord, Micah Ruiz Esparza, Shane Anderson and Miranda Chafin, and Foundation board member Russ Berlin. 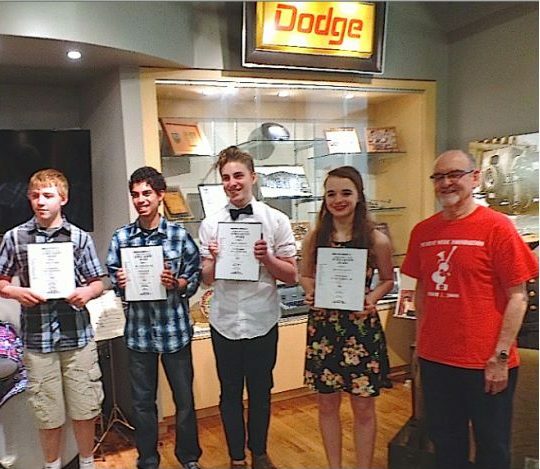 On May 15, 2015, the Metheny Music Foundation awarded its annual music camp and summer studies scholarships at the Lee’s Summit History Museum. Lee’s Summit, MO is the hometown of 20-time Grammy winner Pat Metheny and his brother Mike, who is the Foundation’s chairman. The new museum opened in April and it features an exhibit recounting the 100-year history of the Metheny family in Lee’s Summit. Anderson, Mosier and Nord will be attending the KC Bass Workshop, Chaffin will attend the UMKC Saxophone camp, and Esparza will attend Camp Electric in Cedarville, Ohio. The Metheny Foundation has also introduced its first college music scholarship named in honor of William R. and Lorene Metheny Knight. Mrs. Knight was the aunt of Mike and Pat Metheny and a 1935 graduate of Lee’s Summit High School. “The recipient of this year’s Knight Award is multi-instrumentalist Quinn Mosier,” said Mike Metheny. “Quinn is primarily a string bass player, but he sounds very good on just about anything he plays. Or sings!” Mosier received his scholarship onstage at the Lee’s Summit Symphony Orchestra concert on May 9.